Watch the full movie and share with your loved ones. 1. The entire population, even the new-born babies, are quite toxic today. 2. Everyone is mineral-deficient. Even the babies are deficient because their mothers, today, are nutritionally depleted in almost all cases, even those who claim to eat “a super healthful diet”. This article discusses this important situation – its causes and correction. These are important facts today that are obvious to anyone who understands hair mineral analysis. Unfortunately, this simple, powerful, and relatively inexpensive assessment tool is not used very much in medicine or even holistic health care. 1. About two dozen toxic metals. These include the common ones such as mercury, lead, arsenic, aluminum, nickel, cadmium, antimony, bismuth, uranium, and others. It also includes toxic forms of vital or physiological minerals such as iron, copper, manganese, cobalt, boron, strontium, molybdenum, lithium, chromium, and selenium. These elements in the wrong form are very irritating and toxic. On the Center for Development website and in my books, I call them The Amigos. Toxic metals, and toxic forms of physiological minerals, are the worst type of toxins, in my opinion, although the US government says that toxic chemicals are worse. In my clinical experience of about 32 years, most chemical toxins come out of the body rather easily with a proper program. Removing toxic metals, however, takes years and cannot be done deeply enough with chelation therapy of any kind. Removing them deeply requires a nutritional balancing program, and several years, at least, to remove the worst of them. This topic is explained more in two articles Toxic Metals and Chelation Therapy. Also, urine challenge tests, hair tests, blood tests, stool tests and others cannot detect most toxic metals because they are hidden deep in the brain, the liver and elsewhere, so you cannot depend upon these tests to tell how many toxic metals you have. 2. Toxic chemicals. There are thousands of these in the water, air and food supplies today. They range from pesticides and insecticides (which are among the worst) to solvents, food additives, packaging materials, industrial effluent from factories, car exhaust, building materials, and more. For more on this topic, read Chemical Toxicity. 3. Biological toxins. These are infective organisms such as bacteria, viruses, parasites, fungi, cancers, and perhaps others. The toxicity stems from not only the activity of the organisms itself, but also many of them secrete toxins that are called endotoxins and exotoxins. A very important source of biological toxins is the use of any vaccines, booster shots and flu shots whatsoever. Not only do they introduce the intended virus or germ into the body, but many are contaminated with other viruses as well. In addition, they contain chemical toxins and toxic metals in almost all cases. An overlooked chemical toxicity consists of powerful toxins generated in the intestines when one’s diet and/or digestion are improper. Some of one’s food ferments or rots, generating very toxic substances such asindols, skatols, and cadaverine that often cause few symptoms, but may cause gas, bloating and other digestive upset. 4. Mental and emotional toxins. These are not discussed often, but they are real. They consist of negative attitudes, untrue and harmful idea, beliefs or perspectives, and emotions that are harmful and that a person tends to hold on to. They can include various neuroses, fixations, and perhaps phobias, which are a type of neurosis. A number of articles on this website discuss the effects of attitudes and emotions on one’s health. Traumas of all kinds are another type of mental/emotional toxin that can cause severe dysfunctions in the body and mind, as well. 5. Electrical and electromagnetic toxins. These include emanations, frequencies, electrical and magnetic fields, and/or vibrations of many kinds that are not compatible with human physiology. They come from cell phones, portable phones, gas turbine blades in aircraft, 220-volt wiring, occasionally 110-volt wiring, spark devices such as automobile ignition coils, television sets, computer screens and other computer components, and to some degree from all electrically powered devices such as motors, coils, and many others. Another source is high-tension power lines, transformers, some junction boxes, flickering lights such as fluorescent lamps, and other devices. They also include geopathic stress lines in the earth. These are a natural source of emanations, some of which are healthful and others harmful. They are everywhere and impossible to avoid completely. However, some people feel less comfortable in some locations, and dowsers can often locate these spots or lines and help people move their beds and other furniture to avoid them. Others are emanations from MRI machines, other diagnostic and therapy machines, stars or so-called sun spots, although these are less important. In fact, almost all living and even non-living things give off some electrical energy, even mineral deposits in the earth. Most are benign, fortunately. 6. Etheric toxins. These are very subtle toxins, but quite real. They are not familiar to most people or to physicians. I am just learning about them myself. They include entities, as well as the familiar ionizing radiation that comes from all x-rays, CAT and some other scans. More unusual ones are fragments of souls that seem to settle inside our bodies somehow. This is known to Native people around the world, who practice what they call soul recovery and other shamanistic techniques to remove these fragments that are not visible, but apparently are real. WHY IS EVERYONE SO TOXIC TODAY? The main reason is contamination of the air, water, food and elsewhere due to industrialization, the use of plastics, and other toxic materials that are widely dispersed today. Also, electrical and electronic devices are everywhere. Also, as mentioned above, the young women and mothers-to-be are extremely toxic, and many types of toxins are passed directly from mother to child in the womb. This is termed congenital toxicity, a very important subject if one wishes to improve the human race anytime soon. The problem of toxicity is getting better in some ways, as many laws have been passed to limit the dumping of toxic substances into the water, food supply and air. However, other hazards are getting much worse, such as electromagnetic pollution and some chemicals and metals that are still widely used in industry, in fuels, in consumer products and elsewhere. Conventional or traditional medical care almost completely ignores this problem of widespread and epidemic toxicity of the bodies. They do not realize the direct connection between it and the illnesses of our times. This will change eventually, and I have been writing about it for over 30 years. However, I fear it will take a while, because even the holistic and naturopathic doctors don’t understand it yet. If they did understand it, doctors would immediately stop prescribing most drugs and some surgery, as both are quite toxic methods. Doctors of all kinds would also be much more careful with herbs and even homeopathy, as these are not that benign in many cases, either. Doctors and public health officials would also begin to teach the people to clean up their homes, their offices, their diets, the water they drink and bathe in, and every aspect of their lives. One of the main reasons I prefer nutritional balancing science to all other medical and holistic methods of health care is that it alone addresses ALL the types of toxins listed above, and perhaps others. This is quite remarkable, in my view, and it is no doubt a major reason why I have found this particular science or healing approach to be far more effective and safer than all others. 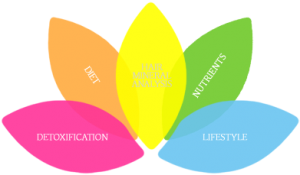 In fact, nutritional balancing, with the help of the proper diet, lifestyle, detoxification procedures such as sauna therapy and coffee enemas, are one of very few methods I am aware of that consistently removes toxins on all levels. Most, if not all children, are born depleted and get a bad start due to depletion of their mothers. For more on this, read about Pre-Natal Care. Eating raw food and vegetarian diets, unfortunately, always makes the problem much, much worse. For more on this general topic, read Health Foods That Are Not Healthy on the Center for Development website. Taking medical drugs usually irritates the intestinal trace and worsens digestion. Some drugs also interfere with, and use up nutrients, and most contain toxins, making the situation much worse. Vaccines are even worse, including even flu shots. Once again, I am not hopeful that mainstream and even most holistic doctors and naturopaths will someday soon understand just how serious this problem is. If they did, they would not waste the people’s money on expensive tests and drugs, but would first correct the diet, improve the digestion and encourage proper nutritional supplementation to reverse this terrible situation. In our experience, when this is done, and a digestive aid given as well, most health conditions go away on their own without any need for fancy, expensive tests, hormone replacement, chelation, drugs or even surgery in most cases. This is how powerful proper nutrition and releasing toxins can be.